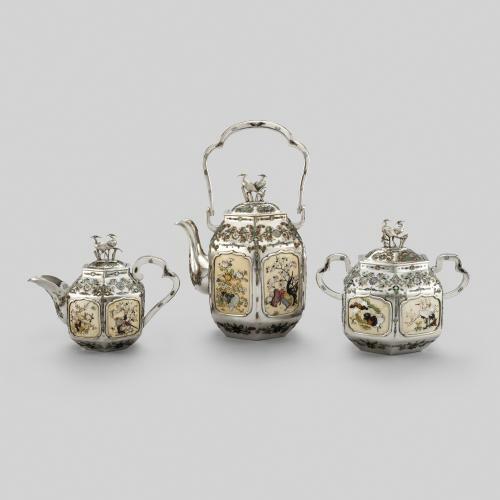 This tea and coffee set was made by Georg Jensen (1866-1935), a Danish silversmith whose work was heavily influenced by the Arts and Crafts and Art Nouveau movements in Europe. In 1904, Jensen opened his own shop on a fashionable Copenhagen street and began making silver jewellery and accessory sets embellished with semi-precious stones. His name quickly became synonymous with high quality craftsmanship. In keeping with the Arts and Crafts tradition, he drew inspiration from nature and incorporated many floral motifs within his work. 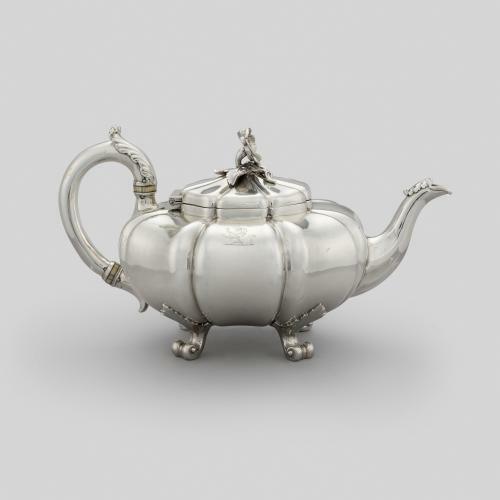 Comprising a teapot, coffee pot, milk jug and sugar bowl, the design of this silver tea set is known as ‘Blossom’ (or ‘Magnolia’ in Danish) and features hammered surfaces, ivory handles and large naturalistic magnolias curling across the lids. This design was introduced in 1905 and was an immediate success, praised in the Danish press. A teapot of this design was subsequently purchased by the Danish Museum of Decorative Art and the design remains Jensen’s best known work.